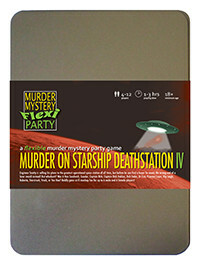 You've been invited to play the role of Vrock in Murder on Starship Deathstation IV. The infamous Engineer Snotty has just finished the plans for the greatest operational space station of all time, and now he’s invited all sorts of scum and villainy from the across the galaxy to bid for them. But before the auction can begin, Snotty is found in pieces, literally, on the wrong end of a laser-sword! Can you boldly go and find his killer before they strike back again?! VROCK is a Culkin! Pointy ears, blue round neck, starship insignia, black trousers and boots. A haircut like it’s been cut using a bowl as a template completes the picture. including the whizzbang evaporator core, the never-ending laser bulb (which was later used in laser swords) and the ultimate karaoke scoring mechanism. Nowadays he hangs out with Captain Birk as a teacher at Starfleet Academy but his days of innovation are over as, predictably, his half-human side spoiled all that when he developed emotions. I am Vrock. It is entirely logical that one of us here is the killer. Although statistically speaking it is most likely the killer is a white male humanoid. Snotty, as you called him, was neither a friend nor enemy of mine, although sometimes he was both. I greatly disliked his attempts to defy physics, as this is my job, being half human and half Culkin. Without my whizzbang evaporator core, his blue prints would be worthless. I have absolutely no interest in the plans and never saw them - I boarded with Captain Birk, albeit without his knowledge. On Sundays I attend a group to improve my social skills. Hail, Culkin.